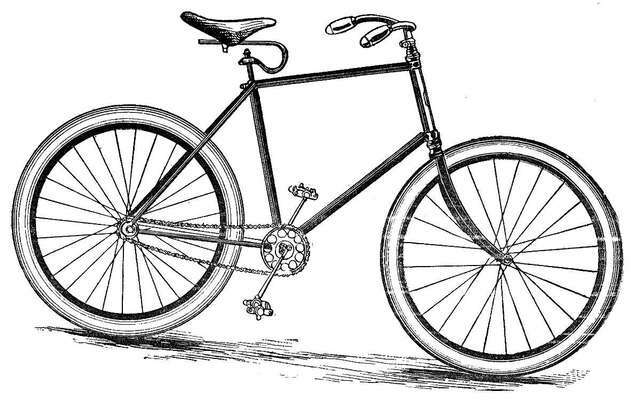 It was a long time ago and not so very far way when the time came about that I met my first and only real bicycle. It was the age of the '70s, the 1970's to be exact yet the bike I beheld would seem much more at home in the 1870's or so it seemed to me. She was tall, spare, and appeared frail to the eye. Although she was tall and spare, frail she was not. Moreover, she didn't labor about her chores, she ran with the wind. When she did, she sang too. As the last child of three daughters in the family, a bicycle was a bit down along the list of priorities in the household. Back then all the kids with families who could afford them had little sporty bikes. They were short with banana seats and extended handlebars. They would fly past the house as it sat on the hill and down to the end of the street as their riders screamed by in delight. Oldest sister, Melody, was rather sedate with her bumptious older bike. It was blue and seemed to have seen hard wear long before she'd ever set eyes upon it. Still, it was of a serviceable sort and acceptable. All that really mattered was that she could ride. And so she did. Middle sister, Betsy, had begged long and hard for a bicycle of her own. She wanted a "real" bike, one of the newer ones so that she could join into the fray outside in the neighborhood. I know that this took some tightening of an already restricted budget to accommodate her pleas by her birthday, but come April 28th, the bike was there. It was shiny and red. It had all the bells and whistles of the time from the banana seat to the over-sized handlebars. Bets could do wheelies and ride without her hands from her first round about the block. The girl was ecstatic. Oh, how I envied her. It was nearly another two years before I garnered my own bike; however, it wasn't the one I had dreamed about for so long. Little did I know the gift I was to receive. No, I got much more than I bargained for. By the time I was ten, I was tall for my age. I could pass for nearly twelve if you didn't talk to me for I could act like I was five if you pushed me. Still, I was adamant about a bike. I simply "had" to have one. Well, I got one and I wasn't happy about it when I did get it. One Saturday afternoon on a visit to my grandmother's house I was informed that I would be getting a bike. Euphoria overtook me. I envisioned the very latest of technology, something shiny and bright with a flash, something short and rugged yet speedy. My dearest grandmother had me follow her back to her musty old garage. It was hot and always stuffy there. The garage smelled of the cedar of which it had been built, the heat, and her car. Grandmom's garage was one of order by design. Everything had its place. Something in there soon lost its place to ride sixty miles home to our house and to become mine. When I saw it, I stood dumbfounded. I'd never seen anything like it before in all my life. It was ugly. It was tall. It was skinny. Its only saving grace was that it was green that was my favorite color, yet even that color was of a dull and graceless shade. The handlebars were tight and small as was the seat. It was so tall, even I, the kid who would dare anything, was afraid to scale the heights to take possession of the seat. Daddy whispered promises of alterations. I was hard pressed to hide my dismay and disgust over it. I'd been promised a bike, a real bike, and I certainly didn't want to hurt my grandmother's feelings over the gift of her cherished treasure to me. I tried but I'm sure I didn't hide it well at all. Disappointment was apparent by any that would look at me. Our family visit was over. We loaded into the old wagon and "my bike" was lashed to the top. I tried very hard not to cry and whine all the way home, but I did anyway; Grandmom couldn't hear me now. I spent the next two hours whining about the bike I didn't get. Laments are curious things. Often we get what we ask for when disguised in different forms. Even before the promised alterations of the banana seat and the arched, Harley 'low-rider' handlebars, I found out that the bike wasn't stodgy. No, I found she was much more than a shadow of the past. It wasn't long before I realized that my bike wasn't "skinny" she was sleek. Her color wasn't simply a dull, drudgy green, but the verdigris of fine copper allowed to age. Her lines were true and clean. Her freshly oiled links hummed with new life and were eager to fly. Yea, she was as eager as I. Still, I hadn't learned to trust her until the day that ugly, mean, and very fast dog on the next street chased me. From the start, I had clothes pinned cards to her rear wheel; three in all for they made the best sound. I was loud and I was there. I wanted all eyes in the neighborhood to know my passing, right up until I passed the wrong house. Over on Woodcrest Avenue, a neighboring street, about the mid-400 block there was a dog. He was big and shaggy and didn't like his territory invaded. He was the only one thoroughly unimpressed by my thundering presence. On my second pass, he came and re-established his territory. Even for a big dog, he was fast. I could hear the rapid click of his nails and the thundering thud of his paws as they pounded the pavement. With labored breaths as I stepped up, stood, leaned forward, and cranked harder on the pedals. His rumbling growl and intent was focused. Fear became my fuel for the dog was large and seemed to slaver and was only inches away. I began to piston. Then my bike did something I never expected. It was as if unseen wings unfurled and labored for lift. The bike flew. The bike went and I with her. Exhilaration over leaving that ugly dog behind left me in a wink and a twinkle. I became much more focused over how fast I could go. I never thought that my grandmother's old bike could meet and far exceed the standards of the day. I had been ashamed to even ride it. Suddenly, I was proud. My shame had been pushed aside. I would never again bow my head over the antics of the 'new' bikes. I had found enchantment with speed and grace. While the bike might be a relic, I didn't care. I knew there wasn't a bike in the neighborhood that could touch her. As long as I had the energy, no one else could ever catch me. It didn't matter if it were an angry dog or the dare of a mad child. Climbing up and on and pushing off took some energy, but flying was easy. I still dream of flight safe in her saddle.